Life’s a pain at times ain’t it? So much to do, such little time. I’m sure you must feel the same way, don’t be too hard on yourself though. So what if corruption has gone from bad to worse? So what if there are over a thousand pending cases, or people think you’ve blatently ignored issues of sectarian/minority killings, hate speech and situations where Suo Moto was appropriate. They’re just jealous because you’re Uncle Nawaz’s favourite and they’re not. 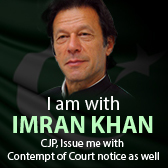 I’ve heard Imran Khan will be coming to court on August 2nd. I think you’d better make sure the gardener’s been around because there are supposed to be a few people accompanying him that day. You might know some of them actually. Remember the guy that drove you around for hours in 2007, he is coming too. I’ve heard he’s a good lawyer too, what’s his name again? You know the one! That led the Lawyers’ Movement to restore you in 2007. Aitzaz Ehsan! That’s the one. Yes, so he’s coming and PTI supporters are just itching to hear the call. So just out of interest why did you go for Imran Khan then? Is it because you’re a cricket fan? There were so many other delightful people to choose from! Never mind, your choice. But they say you should be careful what you ask for, ‘coz you just might get it. I’m not so interested in these things myself but there are lots of opinions floating around on social media from other parties, journos and lawyers too. All saying the same thing in fact, now that’s a first! I’m sorry to be the bearer of bad news but you’re really not number one on their Eid card list but I’m sure you won’t mind. I would perhaps invest some time in the gym though; if things deteriorate significantly for Imran Khan then you might just have to march again, in the opposite direction to last time though. Aitzaz uncle might be able to give you a lift back this time as well if you ask nicely. Just before I go, a few people said to me you are superhuman and not subject to the same scrutiny as any other judicial representatives and people mustn’t speak badly about you because that means they are betraying Pakistan. Is that true? I’d better tell my friends to shut up then before they get summoned before your highness. Bit of a violation of freedom of speech but hey ho Pakistan is violation central! We just can’t get enough of the stuff can we? Anyway it was lovely catching up with you, must dash, the electricity is about to cut off any second now! Don’t worry that’s not your problem either! Ta ta! This entry was posted on Saturday, August 3rd, 2013, 2:45 pm and is filed under PRO-NAWAZ SHARIF TILT OF CHIEF JUSTICE. You can follow any responses to this entry through RSS 2.0. Both comments and pings are currently closed.